Historic research is like working a giant puzzle. You know the answers are out there, but where do you find them? For the last 2 years, our puzzle was Peter Conover Hains. As a Major in the US Army Corps of Engineers he designed and built the foundation for the Morris Island Lighthouse. His decisions in design and construction are, in large part, the reason this lighthouse has been able to withstand multiple hurricanes, the 1886 earthquake and severe erosion. But who was he? How did he get here? What were his accomplishments? These were questions that went unanswered until a Charleston woman approached us with the name and address of the great grandson of Major Hains, Peter Conover Hains, IV. It seems that her deceased husband had served in the army with Peter Conover Hains, III. In speaking with Colonel Hains and, later, several other relatives, we began to develop a picture of an extraordinary engineer and army officer. Peter Conover Hains was born on July 6, 1840 in Philadelphia, the son of a poor shoemaker. He managed to receive an appointment to the U.S. Military Academy at West Point in 1857 and was a classmate of George Armstrong Custer. His class was graduated in June 1861 for service in the Civil War, the first class to graduate in 4 years. Prior to that time, West Point was a five-year program. In his class, there were 31 Union officers, 26 Confederate officers and 9 men rising to the rank of General. Peter was commissioned a Second Lieutenant in the artillery. He was assigned the responsibility and honor of firing the first shot of the Battle of Bull Run. In 1862, he transferred to the engineers and saw action in 30 engagements. Peter Hains received awards for Gallantry and Meritorious Service in the Battle of Hanover Church, Virginia and the Siege of Vicksburg, Mississippi. At Vicksburg, the Chief Engineer fell ill, leaving a young Lieutenant Hains to design the siege for the Union Army 13th Corps under General U. S. Grant. As a result of his innovations and service at Vicksburg, Hains was promoted to the rank of Captain. A monument stands at Vicksburg today recognizing the contributions of Peter Hains. In 1864, Peter Hains married the daughter of Admiral Thornton Jenkins, the Chief of Staff to Union Admiral Farragut. After the war, in 1866, Hains was transferred to the US Army Corps of Engineers. By 1870, he was promoted to the rank of Major and served as District Engineer for the Fifth District of the US Lighthouse Service. He was responsible for the construction of many lighthouses including the Morris Island Lighthouse and the St. Augustine Lighthouse. By 1873, he was appointed Engineer Secretary of the US Lighthouse Board, serving for five years. While serving on the Board, he translated Memoir Upon the Illumination and Beaconage of the Coasts of France, a standard in European lighthouse design and construction. From 1882-1891, Major Hains worked as chief engineer on the Potomac River and Anacastia River. He designed and built the Tidal Basin in Washington, DC, to correct a stagnant, foul smelling problem with 650 acres of swamp and wetlands in Washington. Hains Point, overlooking the Tidal Basin and the Washington Monument, was named in his honor. In 1890, he designed and built the "National Road" from Aquaduct Bridge to Mt. Vernon, later renamed the George Washington Parkway. Peter Hains served on the Nicaragua Canal Commission from 1897-1899 and the Panama Canal Commission from 1897-1907. He successfully argued in favor of the Panama Canal over the Nicaraguan site. He retired from the Army Corps of Engineers in 1904. In 1916, Peter Hains was called to active duty for World War I by a special act of Congress and appointed Major General. General Hains served as Division Engineer for the Army out of Washington, DC, allowing a younger officer to be sent for service in Europe. This appointment left Peter Hains with the distinction of being the only Civil War officer to serve in World War I and was, at the age of 76, the oldest officer in uniform. General Hains died on November 7, 1921 at Walter Reed Hospital and was buried with full military honors at Arlington National Cemetery. General Hains was the first of a long line of military officers. Hains' two sons attended West Point and Annapolis. His grandson, Peter Hains, III graduated West Point in 1924 and was a highly decorated World War II hero landing at Normandy. Peter Hains, IV graduated from West Point in 1952 and retired with the rank of Colonel. Great great grandson John Tower Hains graduated West Point in 1983 and is serving on active duty as a Major in the Infantry. Peter Conover Hains, his two sons and his grandson are all buried at Arlington National Cemetery. Peter Conover Hains was born July 6, 1840, to a relatively poor Philadelphia shoemaker. He attended the U.S. Military Academy at West Point in 1857; George Armstrong Custer was his classmate. After graduating in 1861, Hains served in the Union artillery and fired the first shot of the Battle of Bull Run in Manassas, Virginia. Later in the war, when the chief engineer fell ill at Vicksburg, Hains designed the successful siege for the Union Army under Gen. U.S. Grant. By 1864, Hains had been promoted to Captain and married the daughter of Admiral Thornton Jenkins, chief of staff to Admiral Farragut. Two years later, he transferred to the U.S. Army Corps of Engineers and worked on lighthouse construction from 1868 to 1878, including structures off Morris Island and St. Augustine. By 1882, Hains was working as the chief engineer on the Potomac and Anacostia rivers, and he designed the Tidal Basin, which solved the capital's problem of a foul-smelling, stagnant swamp. The site today is near the Jefferson Memorial, and Hains Point overlooks the basin and the Washington Monument. In 1890, he designed the national road built from Washington to Mount Vernon (now known as the George Washington Parkway). Hains also served on the Nicaragua Canal and Panama Canal commissions and successfully argued to build it in Panama. 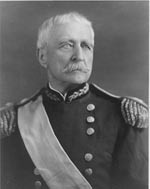 Toward the end of his life, in 1916, he was called to active duty and appointed major general by an act of Congress. This made him the only Civil War officer to serve on active duty in World War I and the oldest U.S. officer in uniform during that war. The more Bostick has uncovered about Hains, the more he understands what he and others are trying to save. Hains designed the 3,200-ton, 158-foot-tall lighthouse in such a solid way that it survives to this day, even though what once was on a beach 1,200 feet from the shore now stands in the water, 1,600 feet from shore. "He actually was an extraordinary engineer, and this work was early in his career," Bostick says. "The fact that the lighthouse has survived is no accident. It was Mayor Hains' work." meritorious services during the war. 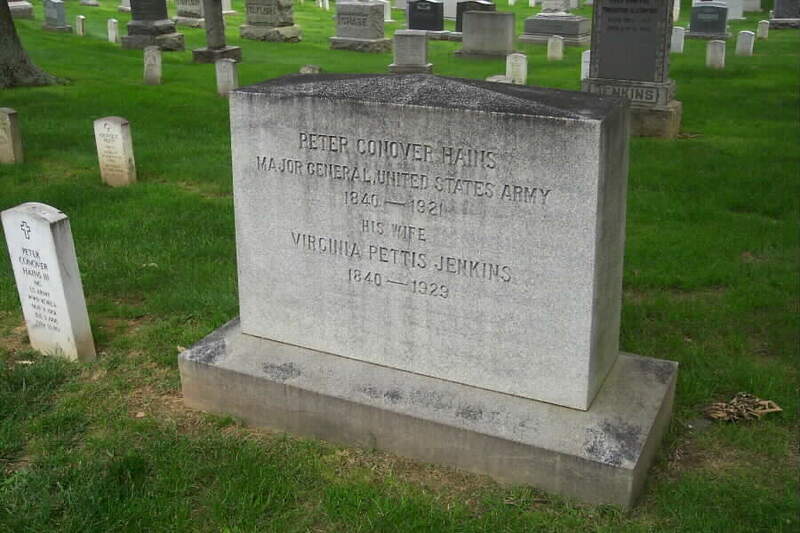 Major General Peter Conover Hains, 1848-1921, and Virginia Pettis Jenkins Hains, 1848-1923. 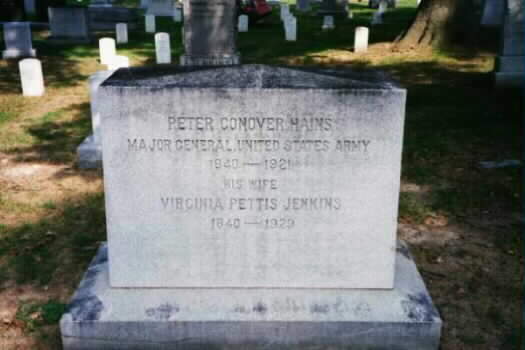 Also buried in Arlington are his sons, John Power Hains, Colonel, United States Army, August 23, 1865-March 25, 1964; Peter Conover Hains, Jr. Captain, United States Army; and his grandson, Peter Conover Hains III, Major General, United States Army.